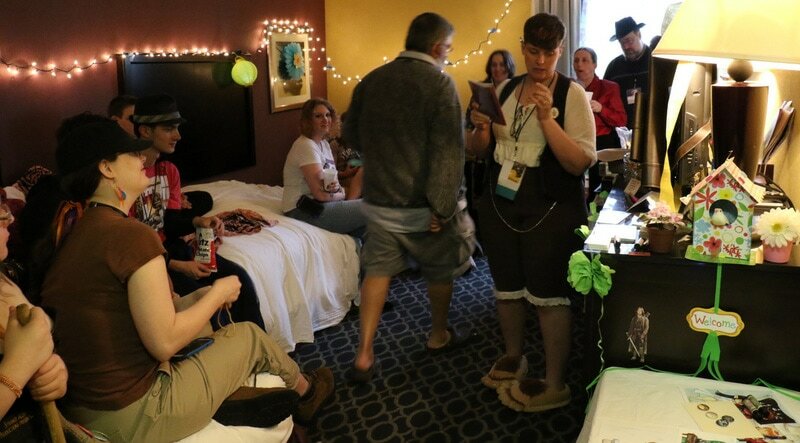 Every year, RavenCon presents an award for the best room party—The RavenConnie, aka The John Jones Memorial Award for Party Excellence. Who gets to vote? Everyone! Ballots will be available in the Con Suite and at the Registration Desk (smart entrants will have copies of the ballot at their party). Completed ballots will also be collected in the Con Suite, at the Registration Desk, and in Con Ops. The party must be registered with the convention (listing it on Filthy Pierre’s Party Board will count). You can also register your party here. The party must be open to all con goers. If you serve alcohol, you must see identification. No underage drinking. Selling alcohol is illegal in the state of Virginia without a liquor license. Collecting tips counts as selling. Please keep noise to a minimum, there may be non-convention guests staying near you. No party can win in more than two consecutive years. One vote per person. Votes without a valid badge number will be discarded. As always, the Convention Rules must be followed. The winner is announced at the Con in Review panel (Sunday, 2:00 p.m.) and the award is presented at Opening Ceremonies the following year. If you’re interested in hosting a room party, please fill out our Party Notification Form so that we can help make sure your party is placed on the official Party Floor. Posted on April 6, 2012 by Doris.